It looks like it's the end of the beginning for the colossal, empty Edgewater Medical Center Buildings in the 5700 block of North Ashland Avenue. 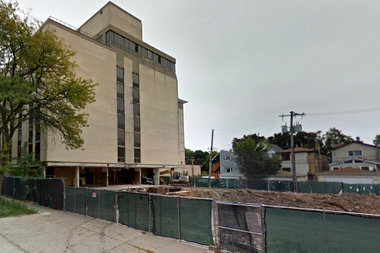 CHICAGO — It could be the beginning of the end for the colossal, empty Edgewater Medical Center buildings in the 5700 block of North Ashland Avenue. Todd Mullen of MCZ Development told two packed rooms at the Experimental Sound Studios last week that he hopes to be tearing down the remaining buildings to the west, and gutting the old hospital by mid-summer. If the work is finished by year’s end, the timeline to rebuild the hulking hospital into 141 apartment units would be 1 year and 2 months, according to Mullen, putting the finish date sometime during 2018. The buildings will need asbestos to be removed before any work begins. Mullen said he hopes to have a contractor hired for the job in the next few weeks. Then, after spending the required period with an exterminator attempting to clear the building of rats and other rodents, the plan is to knock down and gut the buildings. An optimistic projection for the first swing of the wrecking ball is late July. The stolid, heavy brick structures present a challenge in themselves. MCZ sees the project as two distinct parts, with the first being the remediation and demolition, and the second being acquiring the construction permits and then the rebuilding itself. The old hospital itself was built to an “institutional standard,” said Mullen, effectively making it a massive bomb shelter in the middle of town. But a large part of the reason MCZ wanted to build within the old hospital was because of its efficiency — it lays out well for the plumbing, electricity, heating and cooling of a residential building, Mullen said. Of the 141 apartments, 109 will be studios and one-bedrooms and 32 will be two-bedroom units. About 10 percent of the total number made affordable housing. There will be 78 parking spaces in a basement and first floor, and around 120-150 spots for bicycles. The building, because of its layout, will have two lobbies, Mullen said. The parking situation was a concern at the meeting. Several in the crowd questioned whether the number of apartments would mean more cars than parking spaces in a congested neighborhood. Mullen said the type of tenant for the apartments, which he guessed could rent for $1,100-$2,000 a month depending on economic conditions, would travel the city by bicycle, bus, the "L," Uber, or with daily car rentals like ZipCar, which might have a spot at the building. “Our experience is that most of these people will not have cars,” Mullen said. Another concern raised involved the traffic on one-way West Edgewater Avenue. The current housing project from C.A. Development kicked up treacherous conditions, with heavy work trucks and haulers moving the right way — and the wrong way — along the street, creating hazards for traffic, families and children in the area, some said. Mullen said this phase of the plan had not been fully worked out and “would be an issue.” There are potential options to share a construction “hole” with C.A. Development during the demolition, or stagger the demolition process and load from the available alleys to alleviate the pressure. This, Mullen stressed, was a fluid situation. The .89-acre park to be landscaped and built behind the hospital grounds to the west, and rumored to be coveting TIF dollars to complete, was not a topic of conversation at the meeting. Mullen, in fact, made it clear that his company would not handle any part of the green space, leaving the entire project to the Chicago Park District and the community to work out. The last the developers would have to do with that part of the project would be demolishing the final buildings to the northwest. Mullen acknowledged that the apartments could at some point in the future be converted to condominiums. The lending situation with banks after the 2008 economic and real estate crash changed lending conditions drastically, making heavy-collateral and high pre-sales a requirement for condominium projects. Near the end of the civil, mostly calm question-and-answer session, Mullen made an unofficial pact with the two rooms of people who had come out to hear what likely will be one of the final updates before the massive project is underway. “We expect to come back to you multiple times during this process, and, like I said, this is a process," Mullen said. "There will be days when this project will make me so happy I could scream. There will be days when I question every career choice I ever made to get me to this point.